I have resisted the urge to lay out my squares next to each other during this whole CAL, so can you guess how exiting it was to finally see them together??? And I was super happy I had all my ends woven in and all my squares blocked when Esther’s post on joining came up so I could get started right away! The blanket is joined with slip stitches in back loops, the same technique used in Last Dance on the Beach and the technique I chose for Moogly CAL 2016. So I have to admit I did not read Esther’s post that closely, and what I describe below might differ from Esther’s post. I took pile one and two (the two left ones in pic) and joined the squares from top to bottom. To not make the work pull too much in corners I added a single crochet in between the squares, after the last slip stitch was done in two squares and before the first slip stitch was made in the next two. When the two first piles are joined you just grab the next pile and carry on until all squares are joined top to bottom. It does take time to make this join but the result is so pretty it is worth all of your hard work! Do remember to keep your yarn underneath your work, that is what makes the stitches lay so flat. I thought it was quite difficult to make the stitches in the corners where the work was thick. I solved this by adding an extra loop on hook before pulling through, to make sure the yarn would stay on hook. I then removed the extra loop, tightened the yarn and pulled through last loop in hook. When all your squares are joined top to bottom you just do the same thing vertically and you are done. Do NOT weave in your ends, it will not look nice in finished work. You will weave these into the edge later on. Remove your number tags, lay your work out and admire! 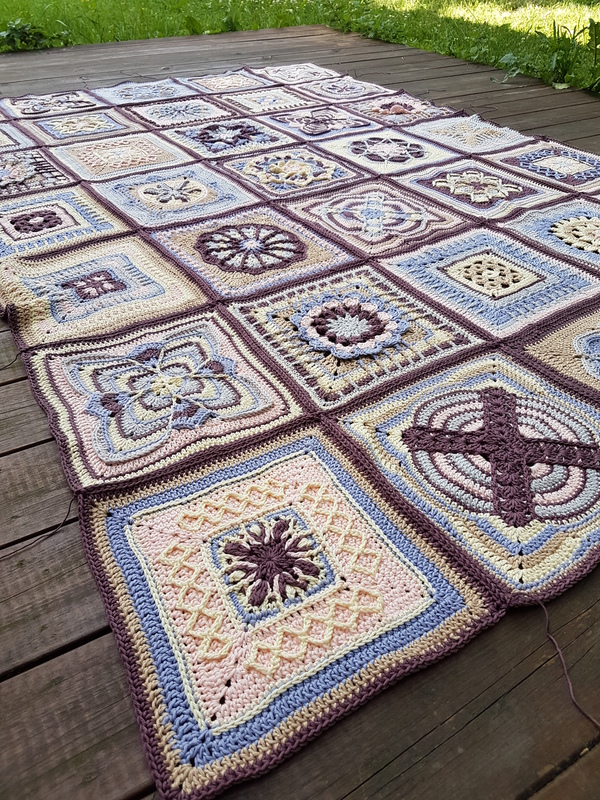 This is the first time I use Drops Muskat for a project this large and I discovered the stitches between the squares tended to pull before the vertical joins were done and the work stabilizes. The blanket is so heavy. Luckily this was covered up by the vertical joins but I advice you to pull your stitches between squares tight and handle your work with care before all joins are done to avoid pulling as much as possible. I think the corners look really nice due to all squares having same corners. Here you find Esther’s post on joinin. 2 July, 2017 in Crochet, Nuts About Squares CAL, Okategoriserade. Last Dance on the Beach, Scheepjes CAL 2016! Colours, Yarns, Tips and Tricks! Mandala Blanket Review, Tips and Tricks! ← Nuts About Tranquility montering!